How do we help providers succeed? Our clients are integrating CareMeasurement.com into their improvement initiatives and using the analytics to manage costs across the continuum of care. By providing a view into the costs of both inpatient care (imported from the hospital EMR and PROs) and post-acute care (imported from CMS), hospitals administrators and physicians are working together to optimize value-based care. With advanced analytics, we support our clients in helping them improve care, cost and collaboration across the care continuum. With our advanced analytics, providers can measure and track multiple process metrics related to patient care. These tools are used to inform and standardize care pathways and help physicians consistently achieve better patient outcomes. 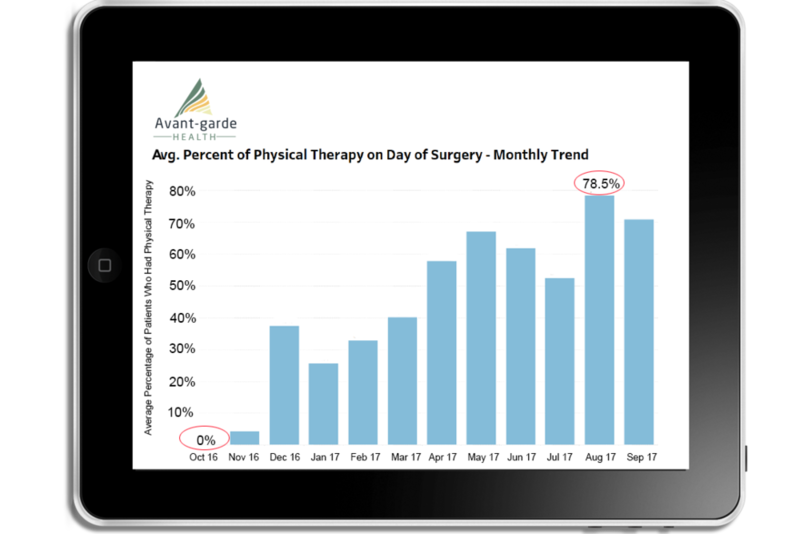 Example: The analytics below demonstrate how one client increased the percentage of patients beginning Physical Therapy on Day of Surgery, which also impacted improvement in additional metrics including Length of Stay, Discharge Disposition, Personnel Costs, and Complication Rate. The client reported a $1,600 per case total cost reduction. With our advanced analytics, providers have insight into true costs related to care delivery. These tools are used to manage spending and identify which levers in the care continuum can be impacted to reduce costs. 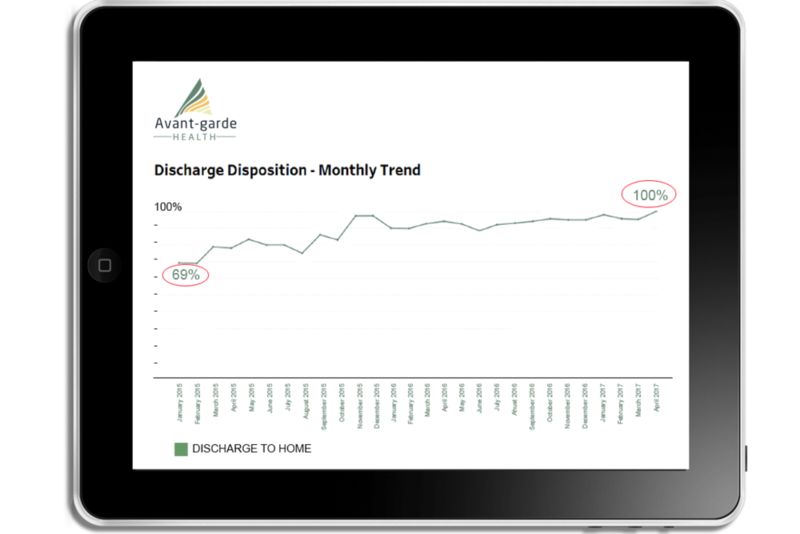 Example: The analytics below are an indicator of improvement in Discharge to Home, which one client set as a service line goal. This improvement correlated to additional cost-driving metrics including a reduction in the use of SNFs and Inpatient Rehab, reduced Post-Acute Care costs, and improved Readmission Rate. The client reported a $6,000 per case total cost reduction. With our advanced analytics, physicians and hospital executives share meaningful analytics to open dialogue then collectively develop and execute improvement plans. These tools are used to identify opportunities and measure progress against plans and goals. Example: The analytics below demonstrate how one client reduced supply costs after sharing data across the team and collaborating on an improvement plan that included renegotiating vendor contacts, eliminating excess, and reducing the use of high-cost items where necessary. These efforts reduced the Total Inpatient Cost by over $1,000 per case.